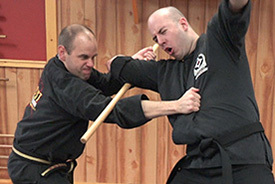 find out this here see it here James Kentoshi Norris is a 7th degree black belt and a member of the To-Shin Do Shihan-Kai (Board of Directors) and has been practicing martial arts over thirty years. He has been a personal student of legendary martial arts master and To-Shin Do founder, Stephen K. Hayes for over two decades. He has worked alongside the State Department to provide security protection for His Holiness the Dalai Lama, and notable celebrities such as Mohammad Ali. His years of work in martial arts, study of bodyguard tactics, and meditation awareness drills have given him many insights into planning and preparing to deal with problems long before they create havoc in our lives. Johanna Norris is a martial artist, physical fitness trainer and wilderness skills instructor. With a 2nd degree Black Belt in To-Shin Do, she has been training in martial arts for almost a decade. An adjunct professor at a liberal arts college and martial arts instructor, Johanna has worked for years to create empowered students. Johanna’s involvement with the founding of Situation Handled arose from designing a program that would prepare and keep safe college students on national and international work projects as part of their academic program. An educator by nature and by profession, Johanna’s focus is on empowering others, especially women, to make the most of their lives.